TORONTO , Jan. 15, 2019 /CNW/ - Spin Master Corp. (TSX:TOY; www.spinmaster.com), a leading global children's entertainment company, is launching a revved up line of Monster Jam® toys, commencing a 10-year licensing partnership with Feld Entertainment Inc. (www.feldentertainment.com). Spin Master is the new worldwide toy partner for Monster Jam, the most accessible and family-friendly sport in the world, delivering edge-of-your-seat, adrenaline-charged excitement to fans of all ages. Spin Master is unveiling the first of the official Monster Jam toy line in stores beginning in January. With a commitment to detailed design and an authentic Monster Jam experience, the trucks incorporate realistic features and new technology, giving fans the opportunity to recreate the magic of the stadium show in their own homes. The all-new Monster Jam play trucks embody the style and swagger of their real-life counterparts. Complete with BKT tires, stylized chrome rims, an authentic chassis with chrome detailing and a molded driver, they are just like the real thing – only fun size! With over 100 Monster Jam trucks to collect, including Grave Digger®, Max-D™, Megalodon®, Monster Mutt® and El Toro Loco®, each 1:64 scale single pack truck also comes with an exclusive collector's poster and driver figure. Ages 3+, 1:64 Scale MSRP $3.99 USD (one pack) / $8.99 USD (two pack), 1:24 Scale MSRP $9.99 USD (one pack). Introducing the Rev 'N Roar 1:43 scale, authentic Monster Jam trucks. Rev forward or backward and listen to the iconic sound of Monster Jam trucks as the Rev 'N Roar comes to life. These loud machines feature four wheel drive and a powerful, internal driving system so they can smash and crash like never before. Ages 3+, MSRP $8.99 USD . From the makers of Kinetic Sand comes the all-new life-like Monster Dirt that mimics real Monster Jam track conditions. This gritty set includes a storage container and a ramp mold that adds a new level of fun and way to play with Monster Jam trucks. Mold, build and jump over realistic ramps for fast, high-flying action. The included, exclusive 1:64 scale die-cast Monster Jam truck is detailed with dirt-stained BKT tires, giving it an even more life-like appearance. Ages 3+, MSRP $9.99 USD Starter Pack / MSRP $19.99 USD Deluxe Set. 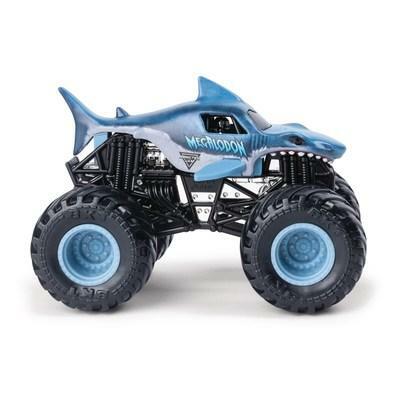 Simulate real Monster Jam action and deliver jaw dropping fun with the new Vehicle Playsets. Launch into the terrifyingly awesome gaping mouth of the Zombie Madness playset and perform gravity-defying stunts or aim for the nose and see an awesome, explosive crash. The mega-fun Champ Ramp Freestyle playset features four unique ramps, a connecting bridge, truck launcher and launch stabilizer so you can perform endless stunts – just like the pros! Ages 3+, MSRP $19.99 USD . "We're thrilled to give Monster Jam fans an elevated play experience with the official launch of Spin Master's authentic Monster Jam toy line," says Ben Gadbois , Director, Global President and COO of Spin Master. "Our commitment to continued innovation is reflected in the meticulous details and features of the trucks and the exciting experiences our partnership with Feld creates. We thrive on pushing the boundaries of imagination and fun, and now Monster Jam fans can simulate real action and play beyond the events they know and love." "The amount of excitement, passion, authenticity and innovation that the Spin Master team is bringing to the Monster Jam brand through more detailed and larger vehicles along with great new play patterns which include the introduction of all new Monster Jam Monster Dirt is inspiring," says Jeff Bialosky , Vice President Licensing and Business Development, Feld Entertainment. "We can see this 10-year partnership going well beyond a decade." Monster Jam produces 350 events each year across five continents to millions of families in attendance. For the 2019 Monster Jam competition, Spin Master is introducing a new competitor with the Bakugan Dragonoid Monster Jam truck. From the animated series BAKUGAN, which debuted on December 23 , this mysterious alien creature is the most powerful in its universe. Fans will recognize the unique aspects of the Bakugan Dragonoid including a prominent horn, sharp teeth and steely eyes that mean business. The Bakugan Monster Jam truck will be called upon to face formidable foes in each Monster Jam competition. Taking control of the powerful Bakugan Dragonoid for the 2019 season will be Camden Murphy , the 2017 Monster Jam Rookie of the Year. Murphy will be competing in the Stadium Championship Series as he returns after two years of Monster Jam Triple Threat Series competition. Bakugan Dragonoid will debut in Anaheim, California on January 12, 2019 . See the expected schedule here. The Monster Jam larger than life experience continues at over 30 Monster Jam Pit Parties taking place in stadiums and arenas across the United States including the World Finals in May. The experience will include all new authentic Monster Jam products including three scales of the Monster Jam trucks, multiple playsets and Monster Dirt, awesome downhill ramp racing, photo opportunities, remote control racing and more. Spin Master (TSX:TOY; www.spinmaster.com) is a leading global children's entertainment company that creates, designs, manufactures, licenses and markets a diversified portfolio of innovative toys, games, products and entertainment properties. Spin Master is best known for award-winning brands including Zoomer®, Bakugan®, Erector® by Meccano®, Hatchimals®, Air Hogs® and PAW Patrol®. Since 2000, Spin Master has received 103 TIA Toy of The Year (TOTY) nominations with 28 wins across a variety of product categories, including 13 TOTY nominations for Innovative Toy of the Year. To date, Spin Master has produced eight television series, including 2007 success Bakugan Battle Brawlers and current hit PAW Patrol, which is broadcast in over 160 countries and territories globally. Spin Master has 28 offices and employs over 1,700 people globally in Canada , United States , Mexico , France , Italy , United Kingdom , Russia , Slovakia , Poland , Germany , Sweden , the Netherlands , China , Hong Kong , Japan , Vietnam and Australia . Feld Entertainment® is the worldwide leader in producing and presenting live touring family entertainment experiences that uplift the human spirit and bring people together. With millions of people in attendance at its shows each year, Feld Entertainment's productions have appeared in more than 75 countries and on six continents to date and include Monster Jam®, Monster Energy Supercross, AMSOIL Arenacross, Disney On Ice, Disney Live! and Marvel Universe LIVE! More information about Feld Entertainment is available online at www.feldentertainment.com.